From Queen Victoria’s head to pictorial landscapes, native birds and famous Kiwis – the country’s postage stamps provide mini representations of New Zealand culture. Stamp collecting has long been a popular hobby, and can sometimes be a good investment too. The first New Zealand postage stamps were issued in 1855 and featured a portrait of Queen Victoria. The first pictorial stamps – with images of the New Zealand landscape – were issued in 1898. One of these, which depicted Lake Taupō, was the first stamp in New Zealand to be printed in more than one colour. Multicoloured stamps became common from the 1950s. Health stamps were introduced in 1929. They cost more than ordinary stamps, and the extra money went to support health camps for poor children. They were still being sold in the early 2000s, but were not as popular as they once were. Stamp designs were chosen by the Post Office, which later became New Zealand Post. Most were designed by professionals, but some were chosen from stamp-design competitions, including competitions for children. New Zealand subjects became more common on stamps over the 20th century. In 1940 there was a series of stamps celebrating 100 years of New Zealand becoming a British colony. Sir Frederic Truby King, who founded the Plunket Society, was the first New Zealand-born person to be featured on a stamp. Christmas stamps are issued each year, and stamps are sometimes issued to celebrate events, for example royal weddings. Some stamps were issued for things other than postage, such as for unemployment benefits or taxes. Between 1897 and 1908 pigeons carried lightweight letters between Great Barrier Island (Aotea) and Auckland, and the two pigeon-post companies had their own stamps. New Zealand dependencies, such as the Cook Islands, Niue, Samoa, Tokelau and even the Ross Dependency – part of Antarctica – have issued stamps. Stamp collecting has been a popular hobby, and sometimes can be a good investment. Stamps are worth more if they are in good condition and are rare. 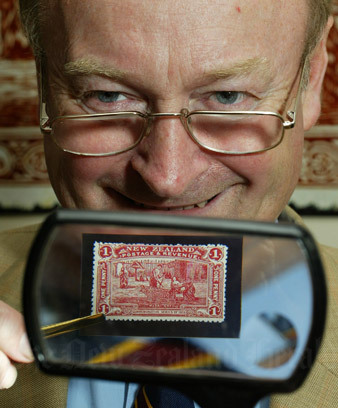 The highest price paid for a New Zealand stamp was $185,000 for an 1855 stamp – one of the first New Zealand stamps. It was sold in London in 2006.